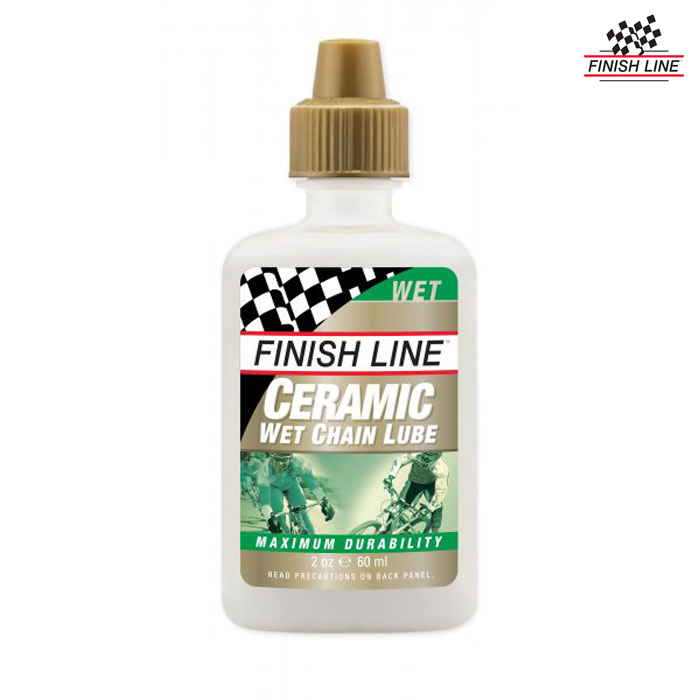 Ceramic Wet lube is Finish Line's most advanced and effective racing lubricant. This wet-style full synthetic lubricant builds a ceramic coating on frictional surfaces resulting in increased smoothness, longer intervals, and a chain that runs so quiet, you will notice the difference. Ceramic Wet's extreme durability holds up even in wet weather conditions. Although more expensive than most lubes, Ceramic Wet delivers more miles per application, often exceeding 175 miles. Ceramic Wet utilizes a patented boron nitride technology. As the first bike lube company to innovate with ceramic particles, Finish Line has set new standards for race day lubrication. Ceramic Wet is changing the way many mechanics prepare their rider's bikes for race day. Ceramic Wet is a fully waterproof lubricant so it can be used in all disciplines: Mountain Bike, Cyclocross, Road and Track racing. Application Tips: To help this lubricant's nano-sized ceramic particles attach themselves onto and into the asperities of the metal, the first application should be applied to a clean, dry surface (Speed Bike Degreaser is recommended). Within three applications, all frictional surfaces of the chain will be fully coated with ceramic particles and maximum benefits will be realized. NOTE: As the white ceramic particles embed themselves, they will displace grime, causing the lubricating film to turn grey or black. Over time (2-3 applications) this phenomenon will lessen or cease. This discolouration is normal and will not compromise performance.